July is here and Wimbledon too – will Andy Murray make it to the final? I do hope so! June was a very busy month here at Darrynane with cottages booked throughout with returning visitors and new faces – most enjoyed good weather at some time.The Lodge makeover is a great success and is busy up until October. 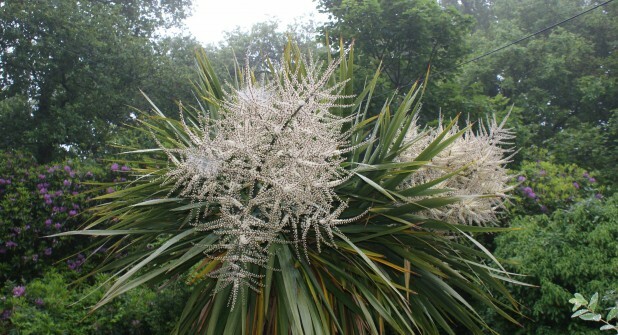 The garden this Spring has been stunning as Azaleas dazzled and huge Rhododendrons blossomed and then much to our surprise the Cornish Yucca in our driveway decided to flower after 15 years – quite spectacular. The deer started to visit again. Nibbling the foliage and generally wandering around the place. He doesn’t stay long if we make any noise. Penny and John, guests for many years, always enjoy Cornwall show during their stay. Over the last few years they have exhibited their honey products. Much to theirs and our delight this year Penny won top accolades with her cakes and John with his honey – well done both. We visited the show on Saturday afternoon a gloriously sunny and warm one. We sauntered around the ground for a few hours and finished at the main ring in time to watch the parade of show champions and their proud owners – all the different breeds of farm animals were represented. We stayed for the horse jumping and finally the Hunt relay – an hilarious event if any of you have seen it. Horses and rider jumping, toppling and generally misbehaving over a series of obstacles. We left around 8.00pm and we both agreed it had been a really great afternoon. Bodmin moor is a hive of activity at the present! 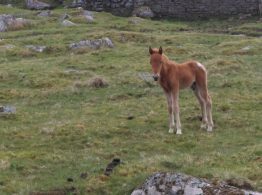 After a slow start in May, with only a couple of foals around, suddenly the place burst into life. By mid June it seemed like every pony had a mouth to feed and then the cattle arrived with their calves. One afternoon when picking up Ameisha from her ride, I watched a young calf playing hide and seek with a gangly legged foal, luckily I’d stopped the car as they careered towards me, recognising the danger they soon scarpered to find their mothers. We’ve enjoyed many different walks on the moor this month. We can’t go too far as Mars Bars is not up to it, but he’s still going strong, against all the odds, and looks forward to his daily jaunt. A few years ago we set our to find the carved stones around the Blisland Moors. The commoners had arranged for a stone mason to carve the name of each moor on a granite boulder somewhere within the moor. With map, compass and GPS we managed to find them all and it generated a number of different walks for us, not always long ones but great for older paws. So we decided to re-trace our steps and find them again. We visited Deacons, not far from the A30. It’s such a vast area we can make our walk as long or as short as we like and there’s water and a stream on the way around so its perfect for the dogs. 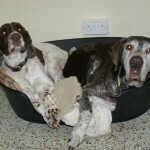 Pebbles & Mars sharing a bed together after on of our jaunts around Bodmin Moor! The birds seem to disappear into the wilderness at this time of the year as the leaves thicken and the trees provide a canopy and safe haven for all to hide. The dawn chorus lessons as the young fledge, it was light at 4.30 am this morning. We’re waiting for the high pressure forecasted by the weathermen to reach Cornwall shortly. So here’s to a great Summer everyone. Don’t forget you can follow us on twitter and like us on facebook! 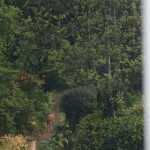 Paul, Chris & Ruby, Lovely cottage in a peaceful setting. Lots of North Cornwall’s attractions within easy reach. Lots of dog friendly places and people around too.